Think of it as part archeology research and part material handling analysis. 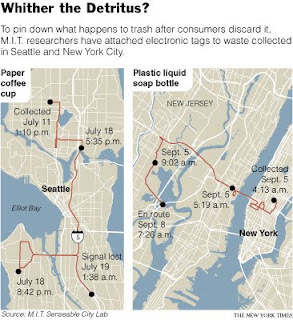 The New York Times highlights a project to track 3,000 pieces of trash with electronic tags and map them as they end up in landfills, rivers or recycling facilities. We're used to simply tossing trash in a bin and forgetting about it. But as landfill space is used up, we will need to better understand, manage and recycle our refuse. The project is being managed by MIT's Senseable City Lab, which uses technology to better understand how cities work. Waste Management, Inc. is helping to fund the project.